Lanarkshire Philatelic Society were delighted, at their opening meeting of the new Session, to give a warm welcome to their oldest member, 99 year old Mrs Helen Bruce, who attends the meetings as often as she is able. 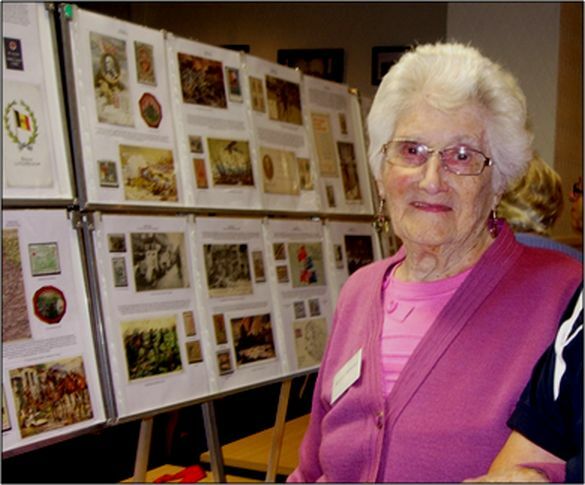 Mrs Helen Bruce, at 99 years old, is the oldest member of the Lanarkshire Philatelic Society. The new President, Gary Cheyne, presented a truly wonderfully descriptive display of World War 1. He informed the meeting that this had arisen from helping his son with his school history project on this subject. Philatelic Material stored in the cupboard was brought out – and ‘the rest is history’! With an amazing array of postcards, stamps, postal stationery and cinderellas he led members through from the European unrest – and feuding Royal families – which culminated in the assassination of Franz Ferdinand in Sarajevo on 28th July, 1914. When Germany marched through Belgium en route to France, Britain, supporting the neutrality of Belgium, entered the War – 4th August, 1914. The Allies ( France, Ireland and Russia) now faced the Central Powers (Germany, Austria-Hungary, Turkey). The Battle of Mons was the first Battle with Germany on the Western Front. Gary continued to outline the course of the war with philatelic material from various countries – the Eastern Front, Western Front; battles fought on land and at sea; personalities; victories and defeats; trench warfare; the Gallipoli campaign and disaster, - with many cards recalling the story of ‘the man with the donkey' (John Simpson Kirkpatrick); the entry of the USA into the war in April 1917; views of the destruction wreaked on towns and countries; final defeat of the Turks; various cards recording the controversy surrounding the actions of Earl Haig. There were also cards with poems written by the ‘War Poets’ – including Harry Lauder’s ‘Keep Right on to the end of the Road’ – and also some cards showing cartoons drawn at the battle front. Then the collapse of Germany’s Allies and the Signing of the Armistice at 11am on 11th November 1918 in Compiègne, France. Gary finished his display with some further material displaying the awful aftermath of the destructiveness of War. 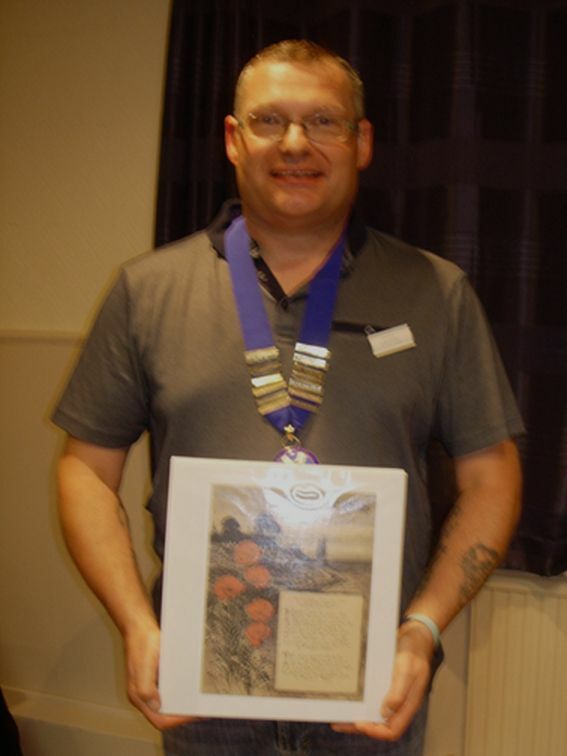 Immediate Past President, Terry Woods, led members in giving warm thanks to Gary Cheyne for presenting such a wonderfully detailed display of the cause and ultimate progress of the First World War. Our next meeting in the Caledonian Bowling Club, Motherwell Road, Hamilton, is on Friday, 21st September, 2018, at 7:30pm when members look forward to welcoming Dr David Stalker who will give his display of ‘New Zealand’.